Pioneer Mining Supply is the home of the famous Blue Bowl concentrator in Northern California. Pioneer Mining supplies is located at 878 High St, Auburn, CA and caters to prospectors and treasure hunters worldwide. Heather Willis is the store manager. Step back in time and experience the Gold Rush adventure. You supply the dream, and we supply the gear to make it a reality. We stock new power sluices, sluice boxes, pans, and all your basic needs for prospecting. Here you will find items we offer online. If you want to see even more of our great products, come visit us at our store location. We have a large selection of books, metal detectors, wet suits, rock tools, and any other prospecting tools you may need. Location. The Nevada City district is in western Nevada County. The district covers an extensive area, from the vicinity of Indian Flat east through Nevada City, northeast to Willow Valley and southeast through Canada Hill and Banner Hill to the vicinity of the Lava Cap mine. It is both a lode- and placer-mining district and once was an important center of gold mining in California. History. Gold was first mined in this district in Deer Creek, which, in 1849, was called Deer Creek Diggings. The name Nevada was adopted in May 1850 at a public meeting. The placers were rich, and the town grew fast. Hydraulic mining was first practiced in California at American Hill here in 1852, by E. G. Matteson (hydraulicking was also done that same year at Yankee Jims in Placer County). Hydraulic mining flourished until around 1880. Drift mining began in the 1850s, and the drift mines were continuously active until around 1900. Gold-quartz was discovered in 1850, when the Gold Tunnel vein was found. However, important production of lode gold did not commence until the early 1860s because of difficulties in milling the ore. By 1865, the output from lode-gold mining was averaging $500,000 per year and later ranged from $300,000 to $600,000. 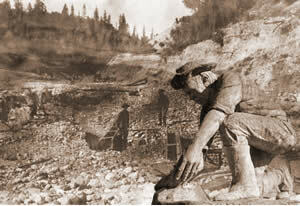 The Champion and Providence mines were the major producers during these years. Later these two mines were in litigation, and in 1902 the Champion owners bought the Providence. Large-scale lode-gold mining was resumed in the district again during the 1930s when the Lava Cap and Banner mines were operating. From 1933 to 1942, the Lava Cap yielded $12-million. There has been only minor activity since 1942. The old town of Nevada City, the county seat, is now a popular tourist center with numerous well-preserved old buildings. The Nevada County Narrow Gauge railroad served the area from 1877 to 1942. The total output of the district is unknown, but it is estimated by the author at more than $50 million and may have exceeded $70 million. Geology. The central portion of the district is underlain by granitic rocks, chiefly granodiorite. Adjacent are beds of slate, mica schist, and quartzite, most of which are part of the Calaveras Formation (Carboniferous to Permian). To the west and southwest are fairly extensive beds of massive greenstone, amphibolite, and serpentine. There are a number of fine- to medium-grained dioritic and aplitic dikes, some of which are associated with the gold-quartz, veins. In places these rocks are overlain by Tertiary channel gravels capped by rhyolite and andesite. Ore Deposits. Several major gold-quartz vein systems traverse the district. In the west portion one system extends northwest along a granodiorite-metasedimentary rock contact. In the southern and eastern portion of the district the veins strike nearly west and dip either north or south. There are also a few northeast-striking and southeast-dipping veins. The veins usually are one to four feet thick, but in places a few are as much as 15 feet thick. The ore contains varying amounts of free gold, often abundant pyrite and smaller amounts of other sulfides. Some of the ore bodies are extensive; the ore body at the Providence mine persisted to an inclined depth of more than 2700 feet. Considerable high-grade ore has been recovered in the district. Several important Tertiary channels were sources of ore-bearing gravels. One, the Harmony channel, which enters the district from the northeast, was extensively mined by drifting. The pay gravel in this channel was 150 to 200 feet wide, two to four feet deep, quartzitic, often sub-angular and well-cemented. These pay streaks yielded $1.55 to $2.50 in gold to the ton, at the old price. The Manzanita channel, which yielded $3 million- is last to the west. Northwest of town is the northwest-trending Cement Hill channel. In the southern part of the district is the Town Talk channel, which was narrow but rich in places. Much of the placer gold taken from the channel deposits in this district was coarse. Mines. Lode: Alaska, Alice Belle, Alpine, Bagley, Banner $1 million+, Belle Fontaine, Buckeye, Caledonia, California Cons. $1 million, Canada Hill $1.13 million, Carter, Central South Yuba, Champion $3 million, Coan, Deadwood $300,000, Enterprise, Federal Loan $200,000, Fortune, Franklin, Glencoe, Gold Flat, Gold Metal, Gold Tunnel $300,000, Gracie, Hoge $600,000, Kirkham, Lava Cap $12 million, Le Compton, Massachusetts, Mayflower, Merrifield, Merrimac, Montana, Mohigan, Mountaineer $2 million to $3 million, Mt. Auburn, Murchie, National, Neversweat, Nevada City, Oustomah, Phoenix $200,000, Pittsburgh $1 million+, Sneath and Clay $180,000, Soggs, Spanish, St. Louis, Texas, Union, Willow Valley $130,000, Wyoming. Drift: Allison, Cold Springs, Coleman, Dean, East Harmony, Fountain Head, Grover, Hughes, Kansas, Knickerbacker, Live Oak, Manzanita, Nebraska, Nevins, Odin, Pennsylvania, Phoenix, West Harmony, Yosemite. Hydraulic: American Hill, Buckeye Hill, Canada Hill, Hirschmann. Excerpt from: Gold Districts of California, by: W.B. Clark, California Department of Conservation, Division of Mines and Geology, Bulletin 193, 1970. James Marshall is said to have prospected Deer Creek in the summer of 1848. Reportedly the first white man to pan for gold at this spot, he met with little success and unfortunately moved on to search for better diggings. Had he stayed he might have made a strike, for the placers of Deer Creek and the surrounding region proved to be phenomenally rich. A man named Hunt is believed to have discovered the rich auriferous deposits at Deer Creek in the fall of 1849, at which time the area became known as Deer Creek Dry Diggings. In September of the same year, three young miners by the names of Thomas Cross, John Pennington, and William McCaig built the first cabin in the diggings, just above where Gold Run empties into the creek known as Deer. When Dr. A. B. Caldwell, owner of a supply store four miles downstream at Beckville, heard of the activity at Deer Creek Dry Diggings, he came to take a look for himself and promptly decided to establish his second store in the new camp. That October he built a log cabin on the slope of Aristocracy Hill, near the present site of Trinity Episcopal Church, and set up a general merchandise store. Due to his popularity with the miners, Deer Creek Dry Diggings came to be known as Caldwells Upper Store. The region was rich, early reports tell of miners panning a pound of gold a day from the bed of Deer Creek, and the camp grew quickly. The harsh winter proved only a minor discomfort (as long as there was gold), and by 1850 nearly one thousand people resided in the area. The ravines were literally thick with miners, and American Hill was covered with a jumble of brush houses, canvas tents, and log cabins. A public meeting was called in March of 1850 in order to elect a city government for the rapidly growing town. One of the earliest miners, a man by the name of Stamps, was elected Alcalde. At the same time, a vote was taken to rename the camp. From such choices as Deer Creek, Aurora, Gold Run, and Sierra, the name Nevada, meaning �snow-covered� in Spanish, was chosen, possibly due to the heavy snowfall the previous winter. When the post office was established in December, the name Nevada City was applied, which appears on the 1851 maps of Butler and Milleson. Several other maps; however, simply marked the spot as �Nevada,� and for most of the 1850�s both names were used interchangeably. This didn�t present a problem until Nevada Territory was formed in 1861, at which time it became necessary to officially add �City� to the town�s title to avoid confusion with the new territory. The early settlers built their town on a series of hills surrounding Deer Creek, hills with such names as Lost, Nabob, Piety, Wet, American, Cement, Prospect, Bourbon, Aristocracy, Boulder, Oregon, and Buckeye. The town�s unusual pattern of streets, which somewhat resemble the spokes of a twisted wheel, comes from the early days when most of the mining activity took place near the plaza at Deer Creek. After finishing work for the day, the miners would head for their cabins in the hills, following trails that branched out from the plaza in all directions. In time, some of the more favored trails were widened, became wagon roads and were eventually paved. Hydraulic mining traces its origins to the early years of Nevada City. In 1852, a French miner named A. Chabot used a canvas hose about forty feet long to wash dirt and gravel on his claim into a sluice box, where the gold was then separated from the gravel in the usual manner. Early the following year, a miner from Connecticut named E. E. Matteson improved on the method by attaching a crude tin nozzle to the end of a rawhide hose. This enabled him to direct a strong stream of water against the face of a bank on his claim on American Hill, easily washing the pay dirt down into his sluice boxes. As he had once barely escaped death when a bank caved in on him, Matteson saw this as a much safer way to mine. After seeing his success, other miners in the area began using his methods and hydraulic mining was born. The development of quartz and hydraulic mining in the region helped bring about the demise of the wandering prospector, those drifting miners always in search of better diggings, while at the same time insuring the town�s continued existence. Big money was required to work the big mines, so big mining companies were formed, providing steady employment for many of the region�s miners. This encouraged store owners and businessmen to put up permanent, fire-proof buildings for their stores and also resulted in many well-constructed frame homes being built for families which settled down in the area. The placers in the district were worked during most of the 1850�s, finally playing out for good by 1860. The region�s rich quartz and drift mines; however, were continuously active up until around 1900 and were worked intermittently afterwards until 1942. The total production for the region is estimated to be near $70 million. This great amount of gold, along with the importance of being the county seat and the town�s popularity with travelers, have combined to keep Nevada City one of the most intact Gold Rush towns in the state. Many buildings from the 1850�s and 1860�s remain in fine condition, unimpaired by neon lights, billboards, and other detracting raiments of the twentieth century. The town�s business section appears today much as it did during the days of gold, the old buildings with their iron doors and shutters have weathered the years well, as have many of the old Victorian homes in the residential sections of town. As darkness falls and the gas streetlights flicker on, walk along the winding streets and examine the homes, the old business buildings, and the shops within. Drive along Hwy 49 through the mountains, pan for gold in the South Fork of the Yuba River, and enjoy the fresh air.